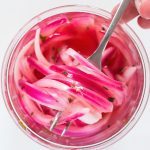 Learn how to make quick pickled onions and in less than 1 hour you have a delicious, crunchy condiment to add to tacos, salads, and more. I have a complicated relationship with onions. As a child I thought I hated onions. Then I started cooking and realized that so many dishes start with frying up some chopped onions. And those cooked onions are part of what makes the recipes so delicious. So then I thought I only liked cooked onions. But that didn’t hold true for long either. 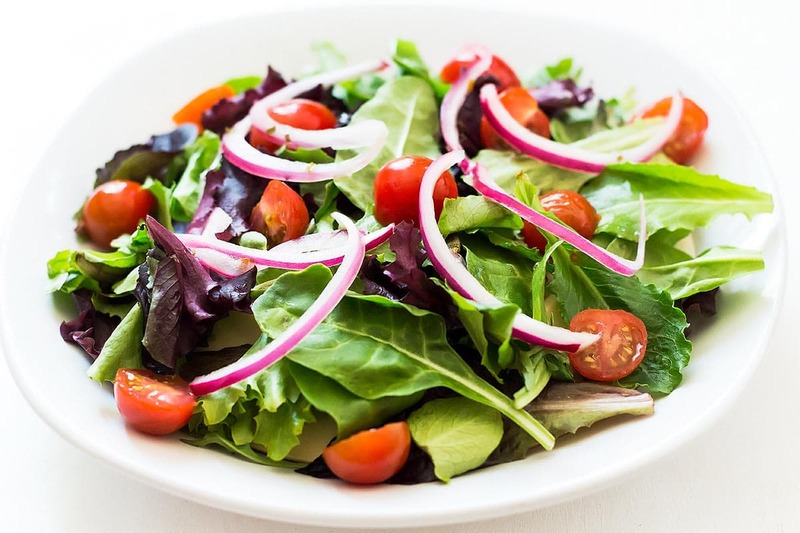 I actually love the crunch and flavor that a few slices of raw red onion give to salads or burgers. But the one thing I dislike to this day is the lingering taste of raw onion in my mouth. Don’t get me wrong, I love it while I am eating. But I don’t want to have the taste of pungent raw onion in my mouth for the rest of the day. That’s when I discovered my love for pickled and marinated onions. They have the same crunchy texture of raw onion, but some of the pungency is eliminated in the pickling process. So that I can fully enjoy them in the moment without regretting it for the remainder of the day. Since this discovery I have tried different ways of making oil marinated onions and quick pickled onions in vinegar. In this process I have developed the best pickled onion recipe (in my humble opinion) and of course I have to share it with you. Making pickled onions is really quite easy and actually a quick process. 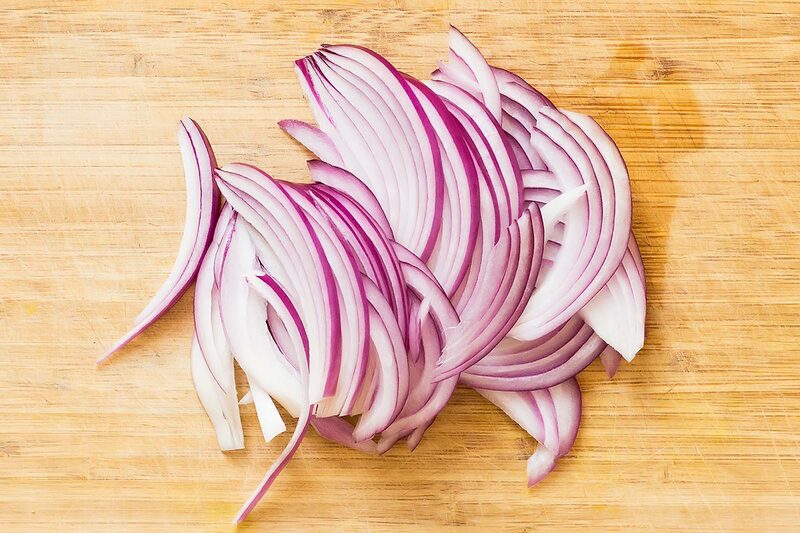 Start with a medium-sized red onion. Cut the onion in half and remove the outer layer. I usually remove the dry skin layer and the next layer underneath as well. Take one half and place it with the cut side down. Cut off the root end and the drier top end. Now look for the ridges and slice the onion thinly along those ridge line. Transfer the onion slices to a large glass jar or container that can hold about 3-3.5 cups (or 2 cups when pickling only half an onion). Now it is time to make the brine for pickled onions. The brine consists of water, vinegar, sweetener, salt, and optional spices. 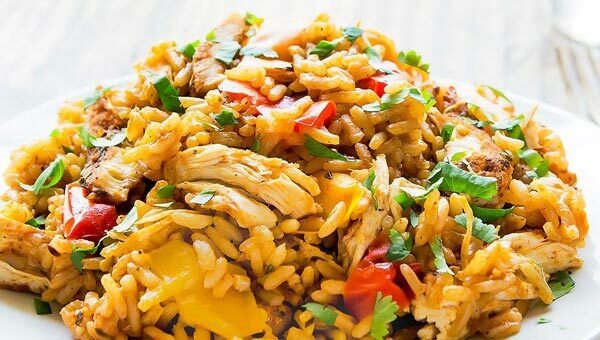 Combine all the brine ingredients in a small saucepan and heat the mixture on medium low. 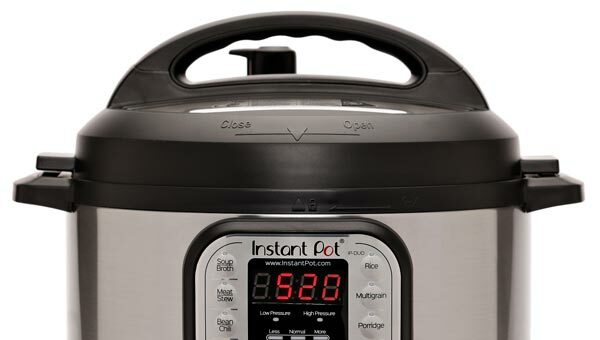 You only want it to reach a gentle simmer stage – no need for a rapid boil. TIP: Be sure to have the exhaust fan running and/or open your kitchen windows. This is to keep the vinegar smell from traveling through your whole house. Now pour the hot brine over the sliced onions in the jar. Using a spoon or fork push the onions down into the brine to keep them covered and submerged. 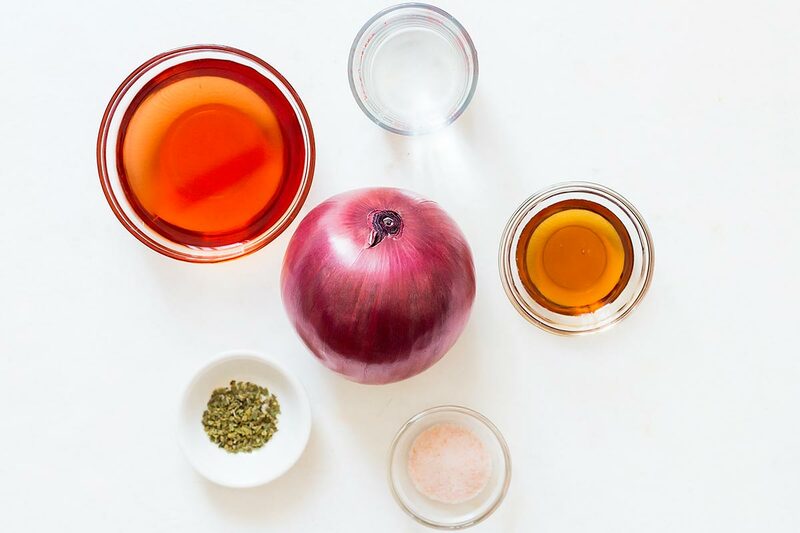 Leave the vinegar and onions out to cool on the counter until they reach room temperature. This only takes about 30 minutes. I told you this really is a quick and easy pickled onion recipe. In this time you will see how the onions are turning from red/purple to hot pink pickled onions. 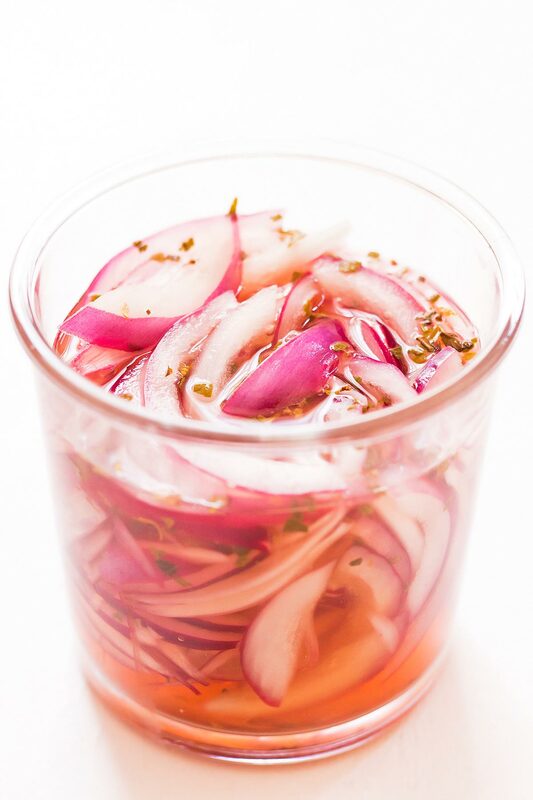 Once cooled down the best pickled onions are now ready to use as condiment and topping. 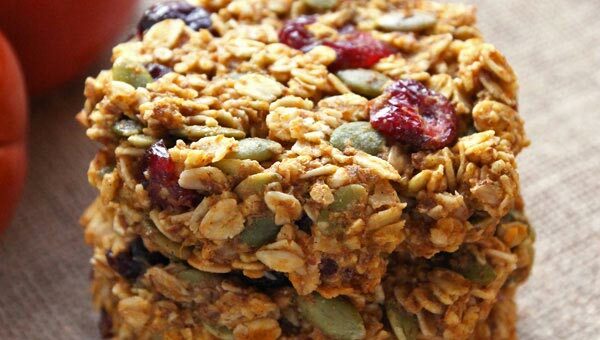 Or cover them at this point and transfer to the fridge until ready to use. Which vinegar to use for pickled onions? 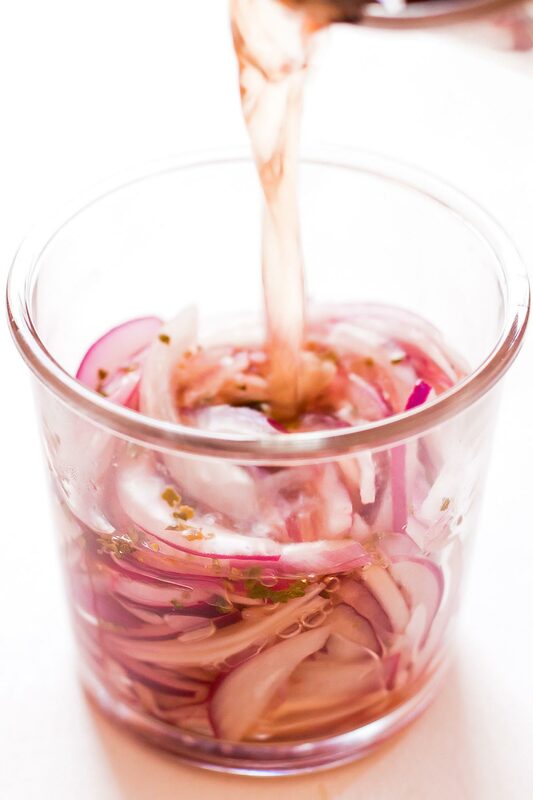 Pickled red onions can be made with any type of vinegar. Personally I have tried simple white vinegar and apple cider vinegar. Then I got the idea to try red wine vinegar from an oil marinated red onions recipe. And it turned out to be my absolute favourite. 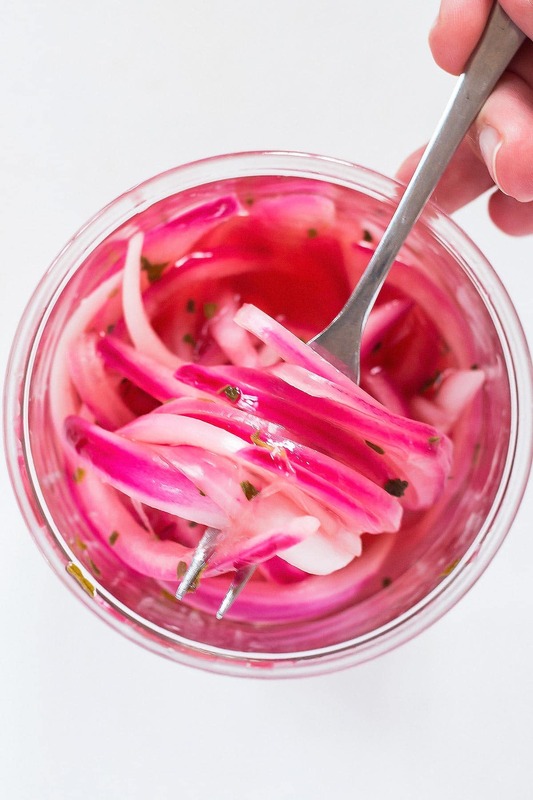 But don’t think you can’t make this easy pickled red onions recipe, if you don’t have red wine vinegar. Substitute with what you have on hand – white vinegar, apple cider, or maybe even white wine vinegar would be great. What spices to add for pickled onions? While most pickled onions brines will only include salt and sweeter (sugar, maple syrup, etc. ), I believe that adding a spice like dried herbs takes these to a whole different level and truly makes them perfect pickled onions. My favourite spice to add for pickled onions is dried oregano. But feel free to experiment yourself and find your own favorite. Adding some chili flakes or powder would be great to turn these into spicy pickled onions, like the Mexican pickled onions you find at taco stands. 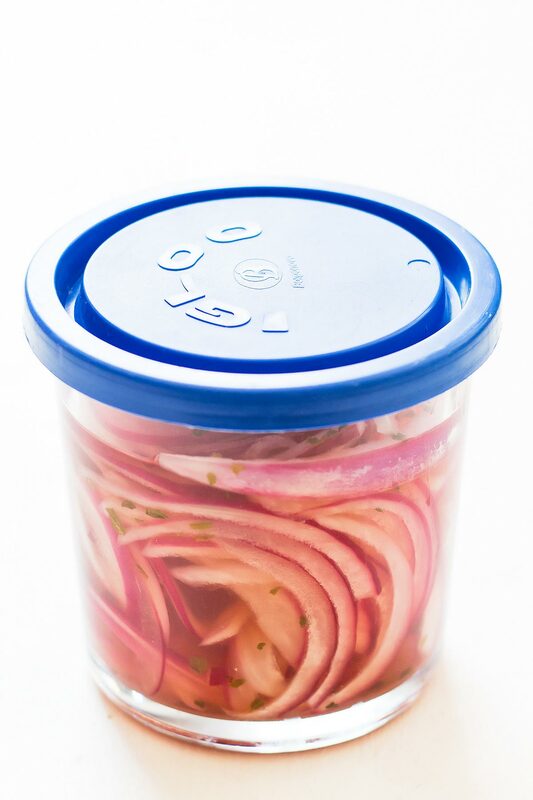 Store the finished simple pickled onions in a covered container in the fridge. Refrigerated they will last 2-3 weeks. There really is no limit on the things you can add pickled onions too. 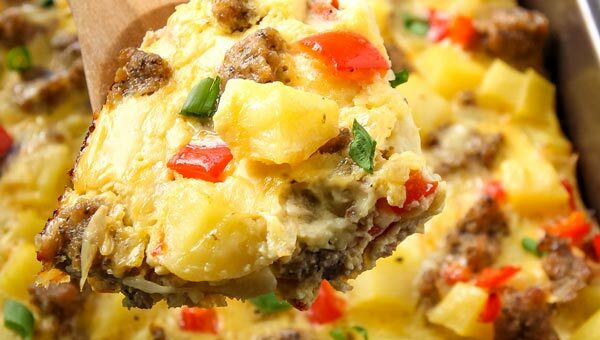 If you think a dish would benefit from pickled onions on top, just go for it! A wooden cutting board and a really sharp kitchen knife help with slicing the onions thinly. I can’t find the exact same round glass containers I use to store the pickled onions, but these Anchor and these Glasslock containers are very similar. Cut the onion in half and peel off the outer skin layer. Slice the onion thinly along the ridge lines you can see on the outside of the onion. Fill the slices tightly into a glass jar. In a small saucepan, stir together the red wine vinegar, water, maple syrup, salt, and oregano. Heat on medium low until the vinegar mixture comes to a gentle simmer. Then pour it over the sliced onions in the jar. Push down the onions with a spoon to keep them submerged in the vinegar. Let them cool to room temperature (about half an hour). Then the quick pickled onions are ready to enjoy. If not using right away, close the jar and store the onions in the fridge for 2-3 weeks. 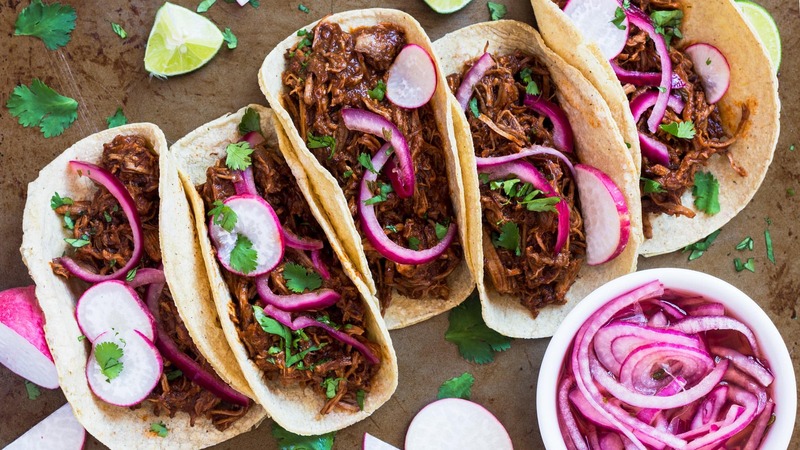 Enjoy the pickled onion on tacos, salads, and burgers or anything else that could benefit from crunchy sweet onions. Tip: Be sure to run the exhaust fan and/or open your kitchen windows to minimize the vinegar smell traveling throughout the entire house.